In 1967, newspaper photos of Pope Paul VI embracing Athenagoras I, the Orthodox patriarch of Constantinople, marked a significant step toward the healing of a division in Christendom that has spanned more than nine centuries. In 1595, when today’s saint was a boy, the Orthodox bishop of Brest-Litovsk (famous in World War I) in Belarus and five other bishops representing millions of Ruthenians, sought reunion with Rome. John Kunsevich (Josaphat became his name in religious life) was to dedicate his life and die for the same cause. Born in what was then Poland, he went to work in Wilno and was influenced by clergy adhering to the Union of Brest (1596). He became a Basilian monk, then a priest, and soon was well known as a preacher and as an ascetic. He became bishop of Vitebsk (now in Russia) at a relatively young age, and faced a difficult situation. Most monks, fearing interference in liturgy and customs, did not want union with Rome. 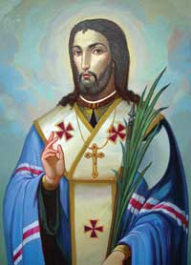 By synods, catechetical instruction, reform of the clergy and personal example, however, Josaphat was successful in winning the greater part of the Orthodox in that area to the union. But the next year a dissident hierarchy was set up, and his opposite number spread the accusation that Josaphat had "gone Latin" and that all his people would have to do the same. He was not enthusiastically supported by the Latin bishops of Poland. Despite warnings, he went to Vitebsk, still a hotbed of trouble. Attempts were made to foment trouble and drive him from the diocese: A priest was sent to shout insults to him from his own courtyard. When Josaphat had him removed and shut up in his house, the opposition rang the town hall bell, and a mob assembled. The priest was released, but members of the mob broke into the bishop’s home. He was struck with a halberd, then shot and his body thrown into the river. It was later recovered and is now buried in St. Peter’s Basilica in Rome. He was the first saint of the Eastern Church to be canonized by Rome. His death brought a movement toward Catholicism and unity, but the controversy continued, and the dissidents, too, had their martyr. After the partition of Poland, the Russians forced most Ruthenians to join the Russian Orthodox Church.